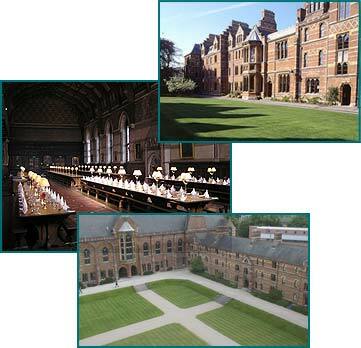 FLOODrisk 2008 will be held at Keble College, Oxford. At the heart of Britain’s oldest university, Keble is one of the architectural landmarks of Oxford, the “sweet city of dreaming spires”. As well as a heritage of history and academic tradition, modern Oxford offers extensive shopping and entertainment including theatre, exhibitions and music. Within a short distance lie the beautiful Cotswolds, Stratford-upon-Avon, home of William Shakespeare, and Blenheim Palace, birth place of Sir Winston Churchill. FLOODrisk 2008 delegates can reserve comfortable and well equipment single study bedrooms (with private shower rooms) at Keble College for the duration of the conference . Telephones and internet connections, tea and coffee making facilities, toiletries and towels come as standard. The Conference has a block booking of rooms at Keble from 29 September to 2 October inclusive. The number of rooms is limited and you are advised to book early to avoid disappointment. If you wish to make reservations at Keble for the nights of 27 and 28 September, you may do this directly using the College’s online booking service - www.OxfordRooms.co.uk. Please state "FLOODSITE" as the promotional code when prompted; this will ensure you get discounted rates and able to stay in the same room throughout the whole of your stay. NOTE – only use this website to book accommodation BEFORE the conference. Accommodation during the conference must be made directly with the Conference organisers. As students return for the new academic term on 3 October, delegates wishing to stay in Oxford after the Conference will need to make alternative accommodation arrangements – for information on the options available visit www.visitoxford.org. Oxford is conveniently reached from Heathrow Airport (1¼ hours), Gatwick Airport (2½ hours) by coach. There is a frequent bus service from Heathrow. London Heathrow and Gatwick airports are linked to Oxford by The Airline coach service, which operates a direct frequent service twenty-four hours a day (tel: +44 (0)1865 785400). London Stansted airport is linked to Oxford by the National Express 757 coach service, running every two hours (tel: +44 (0)8705 747777). Birmingham International Airport is around 2 hours away by road. The airport rail station, Birmingham International, is a two minute ride away on the free Air-Rail Link and is served by frequent national, regional and local rail services. A direct service operates between Oxford and London Paddington (approximately every 30 minutes), and between Oxford and Birmingham New Street via Banbury and Coventry. Other services operate from the north via Birmingham New Street; from the South via Reading; and from the west via Didcot or Reading. For information contact National Rail Enquiries (tel: +44 (0)8457 484950) or visit the Network Rail website. The railway station is approximately 20 minutes' walk from Keble College. Taxi services are available outside the Station entrance. The Coach Station at Gloucester Green is approximately 15 minutes' walk from Keble College. Taxi Services are available from Gloucester Green. Many Oxford streets are now closed to traffic and parking is severely limited. Visitors are encouraged to use the Park and Ride bus services which operate between the city centre and parking areas on the outskirts at Pear Tree, Woodstock Road (north); Water Eaton (north); Seacourt, Botley Road (west); Redbridge, Abingdon Road (south); and Thornhill, London Road (east). Please note that there are no car parking facilities available within the College. FLOODrisk 2008 will make full use of Keble’s modern conference facilities, including the newly-built Sloane Robinson Building. Delegates wishing to stay in the heart of Oxford can book accommodation in one of the College’s comfortable and well equipped rooms, all of which have internet connections. Located opposite the University Museum and parks, Keble is a short stroll away from historic landmarks such as the Bodleian Library and the Sheldonian Theatre, the Randolph Hotel and the Ashmolean Museum. The historic pubs of St Giles and the fashionable restaurants of Little Clarendon Street and Jericho are also close by. The College was founded in memory of John Keble (1792-1866). Benefactors of the new College included William Gibbs, whose family’s fortune was based on Peruvian bird droppings, a valuable fertiliser! Keble College opened its doors to just thirty students in 1870. The architect was William Butterfield, whose striking polychromatic brickwork served as a defiant assertion of a distinctively high church position. If it was the intention of the College’s founders to create a high church seminary, its first Warden, Edward Talbot, had other ideas, encouraging the teaching of science, and showing sympathy to the theory of evolution. Nor could the early students live up to the demands of ‘poverty and obedience’ envisaged by the founders: student life was punctuated by regular unlicensed boxing matches at which, we are told, ‘the liquid refreshment was not tea’. Keble has moved a long way since those early days. Butterfield’s architecture has been supplemented by equally bold buildings, opened in 1979, and the ARCO building, a miracle of environmental soundness, opened in July 1995. Originally intended for ‘gentlemen wishing to live economically’, the College began to admit women undergraduates from 1979 and elected its first female Warden in 1994. Originally dominated by those intending a career in the Church, it now admits students for the full range of subjects and sends them forth to just about every conceivable career. The Lecture Theatre in the Oxford University Museum of Natural History will be used for some parallel sessions during the course of the FLOODrisk 2008. The Museum houses the University's scientific collections of zoological, entomological and geological specimens. The Museum itself is a Grade 1 listed building, renowned for its spectacular neo-Gothic architecture. Among its most famous features are the Oxfordshire dinosaurs, the dodo, and the swifts in the tower. In 2005, together with neighbouring Pitt Rivers, the Museum was the winner of the Guardian Family Friendly Museum Award.